Race Point Publishing, 9781631060496, 144pp. It's time to get your geek on in the kitchen! Comic-lover, avid gamer, and sci-fi and fantasy lover, Cassandra Reeder started The Geeky Chef in 2008. She creates real-life recipes for all the delicious foods you've seen in your favorite sci-fi and fantasy movies, TV shows, and video games. 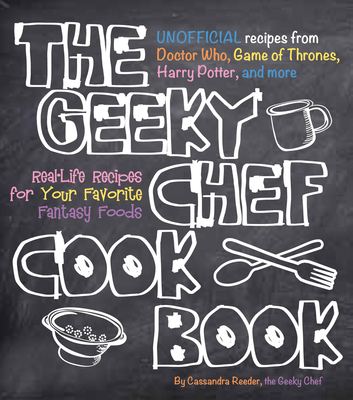 From Game of Thrones and The Hunger Games, to Doctor Who,Legend of Zelda, and World of Warcraft, The Geeky Chef Cookbok features over 60 recipes you can re-create in your own kitchen! Photographed, step-by-step instructions show how to make Pumpkin Pasties from Harry Potter, and Lemon Cakes from Game of Thrones. Sip from a bowl of Plomeek Soup from Star Trek and enjoy with Peeta's Cheesy Bread from The Hunger Games. Fantasy foods are fantasy no longer! Cassandra Reeder is an avid home cook and lifetime geek. For almost a decade, she has been helping other geeks and nerds all over the world make their fictional food fantasies come true at www.geekychef.com. In 2014, she released The Geeky Chef Cookbook, which to her immense delight and gratitude, has been very well received. In 2017, she followed the success of that book with a sequel, The Geeky Chef Strikes Back, a collection of even more unofficial recipes from geek life. Cassandra currently lives in Portland, Oregon.